In this I am going to post few points about Limitations of FSS UI when compared with WAMUI. WAM UI is completely web based so it can be accessible from any where. FSS UI is applet based. After connecting to Report Server from policy server, We can configure Reports and Audits in WAM UI. 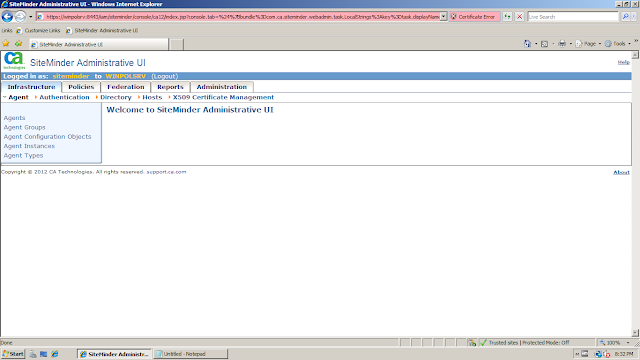 In FSS UI we cannot configure Reports and View Reports. WAM UI have new feature called "Application" which is not available in FSS UI. "Application" in WAM UI is similar to Domain in FSS UI. WAM UI has clear division of Policy Objects like "Administration", "Infrastructure", "Polices" etc., but which are cluttered in FSS UI. WAM UI can be installed in separate server (Not only in Policy Server), FSS UI is available only in Policy server. Following image is for WAM UI 12.5 which even have Federation.